I wrote a post a couple of weeks ago listing some of my favorite vampire books. I cannot imagine what I was thinking leaving off a very excellent book - fit for the top of the list - Richard Matheson's I Am Legend . First of all, the movie with Will Smith is a cool movie. I dug it. But... it is so loosely based on Matheson's work you can barely call it an adaptation. I Am Legend is a fantastic read. The vampire virus (to which Robert Neville is immune) is plausible, and Neville's plight is heart-wrenching. The ending of I Am Legend has to be one of my all time favorite endings. There are a couple of movie adaptations that pre-date the Will Smith version. One of them is a great adaptation starring Vincent Price called The Last Man on Earth . This adaptation follows closely to I Am Legend. If you haven't seen The Last Man on Earth, I highly recommend you read I Am Legend first. While the movie includes Matheson's ending, it fails to capture the same depth and meaning that Matheson conveyed. 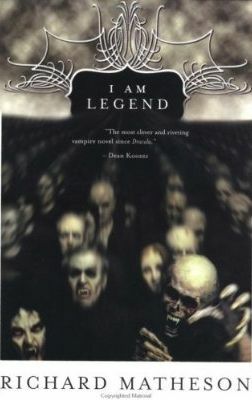 If you are a zombie fan - especially a George Romero fan - or a fan of the vampire, I Am Legend is a definite must read, but I also highly recommend it in general. Oh wow. You learn something new everyday. So the movie called I am legend is not really the book I am legend. But there is a movie called Last Man on Earth that is based on the book I am Legend. Interesting. lol. Thanks for the introduction. I would love to re-read I Am Legend sometime soon. Terrific book. Nice review, Jen! and although I haven't read it yet, THE DELICATE DEPENDENCY by Michael Talbot has a huge cult following. Blog Hop Friday: Happy Mother's Day!